Maraging steels can offer good corrosion resistance in particularly tough environments such as industrial and marine atmospheres due to the characteristic precipitation hardening of their intermetallic compounds. With use in advanced technologies and in sectors such as aerospace, nuclear and gas turbine maraging steels are emerging as an influential material in these specific applications. 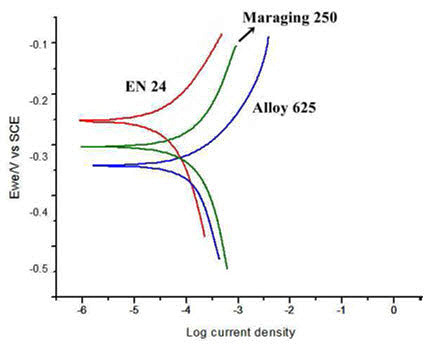 Maraging steels are a special class of ultra-high strength steels that differ from conventional ones in that they are hardened by a metallurgical reaction that does not involve carbon. Instead, these steels are strengthened by the precipitation of intermetallic compounds at temperatures of about 480°C. 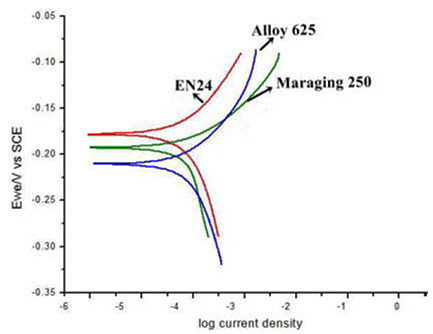 Maraging steels have slightly better corrosion resistance than tempered martensite alloy steels. In industrial and marine atmospheres, the corrosion rates of maraging steel are about half of those of conventional steels. In saline and acidic solutions, maraging steels show somewhat better corrosion resistance. They derive high strength from age hardening of low carbon, Fe-Ni martensitic matrix. The characteristics of this grey and white steel are high ductility, formability, corrosion resistance, high temperature strength and easy to fabricate, weld and treat with heat, and maintain an invariable size even after heat treatment. These steels have emerged as alternative materials to conventional quenched and tempered steels for advanced technologies such as aerospace, nuclear and gas turbine applications. They frequently come in contact with acids during cleaning, pickling, descaling, acidizing, etc. Sulphuric acid is one of the most aggressive acids for iron and its alloys, and is often used as a pickling acid for steel and its alloys. But very little study appears to be done in the area of corrosion behavior and corrosion inhibition of maraging steel. So it is intended to study the corrosion behavior of maraging steel in a sulphuric acid medium. According to available literature, atmospheric exposure of 18 Ni maraging steel leads to corrosion in a uniform manner and it becomes completely rust covered. Pit depths tend to be shallower than high strength steels. Bellanger et al. have shown the effect of slightly acid pH with or without chloride ions in radioactive water on the corrosion of maraging steel, and reported that corrosion behavior of maraging steel at the corrosion potential depends on pH and intermediates remaining on the maraging steel surface in the active region favoring the passivity. The corrosion and corrosion inhibition of maraging steels in sulfuric acid solutions have been investigated by numerous scientists. It was found that maraging steels have higher corrosion resistance in acidic solutions compared to tempered martensite alloy steels. Heterocyclic compounds, especially nitrogen-based ones such as azole derivatives are effective inhibitors for many metals and alloys. This is because azole derivatives containing polar groups including nitrogen, sulfur, and oxygen and heterocyclic compounds with polar functional groups have been reported to be good corrosion inhibitors. The molecules of these compounds form an adsorbed protective film on the metal surface via their functional groups, which isolates the corrosive media from contact with the structure to be protected. The aims of the study of El-Sayed M.Sherif has been to investigate the effects of exposure time, namely 0,90 and 180 min on the corrosion and corrosion mitigation of maraging steel in concentrated sulfuric acid (2.0 M H2SO4) pickling solutions using 5-(3-aminophenyl)-tetrazole (APTA) as a corrosion inhibitor. The work has been performed using electrochemical impedance spectroscopy (EIS) and potentiodynamic polarization (PDP) measurements along with scanning electron microscopy (SEM) and energy dispersive X-ray (EDX) investigations. It has been found that the steel under investigation suffers uniform corrosion and the severity of this corrosion increases with increasing the immersion time as indicated by increasing the values of jCorr and RCorr and decreasing the values of surface, RS, and polarization, Rp, resistances. The addition of 10-3 M APTA greatly reduced the severity of sulfuric acid through decreasing the anodic, cathodic and corrosion currents and corrosion rate, shifting the corrosion potential, ECorr, towards the less negative values and increasing the surface and polarization resistances. This effect was further increased by adding 5×10-3 M APTA, which could minimize all corrosion parameters. SEM/EDX investigations proved that APTA molecules inhibit the corrosion of steel via their adsorption onto the surface. All results were in good agreement and stated clearly that APTA is a good corrosion inhibitor for maraging steel in 2.0 M H2SO4 solutions and its ability increases with the increase of its concentration and elongating the immersion time. On the other hand in the paper of V.Rajkumar, N.Arivazhagan is analysed and compared the corrosion characteristics of martensitic aged (Maraging 250), EN 24 an aeronautical steel and Alloy 625 under 3.5 % NaCl (normal sea water) and 5% NaCl (severe) marine environments and under heat treated conditions in 3.5% NaCl. 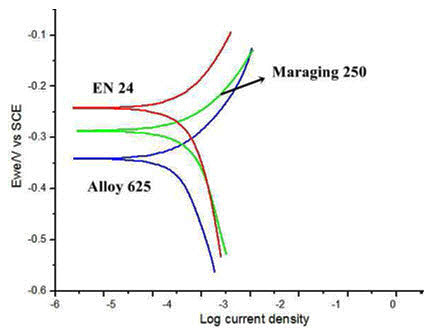 The potentiodynamic polarization curves of the maraging steel, low alloy steel and Alloy 625 are depicted in Figure 1(a, b, c). Corrosion potential is a static indicator of electrochemical corrosion resistance, which reveals the susceptibility of materials to corrosion. As illustrated in Figure 1. The corrosion rates of the two materials are found to be 10.76 and 84.07 mil/year. It can be inferred that the low alloy steel is more highly prone to corrosion than the maraging steel which is highly resistant. It is due to the fact that the low alloy steel, being a medium carbon steel has higher carbon content (0.38%) than the maraging steel (0.10%). The polarization curves of the three materials under (5% NaCl) sea water environments are given in the Figure 2. It is seen that corrosion rates of the heat treated materials are proportionately higher when compared to normally tested samples (without heat treatment). The corrosion rates of the heat treated maraging steel, low alloy steel and super alloy are 16.69, 115.1 and 20.52 mil/year respectively. The polarization curves of the three heat treated materials under (3.5% NaCl) sea water environments are given in the Figure 3. The corrosion rates under 3.5% NaCl environment are 18.86, 135.4 and 26.47 mil/year respectively. These values show pronounced difference in corrosion rates as compared to the samples tested under 3.5 and 5% NaCl and normal conditions.